Allahabad is among the largest cities in Uttar Pradesh.Recorded evidences also exists in the revered scriptures,the vedas and the grand epics,the Ramayana and the Mahabharatha,as also in puranas of this holy place formerly called Prayag.Allahabad is closely associated with the Independence movement where two of India's Prime Minister Jawaharlal Nehru and his daughter Indira Gandhi grew up.Allahabad today is an important city where history,culture and religion create a confluence much like the sacred rivers that cares this God-graced land.It is also known as Prayag and is one of the sacred pilgrimage centres of India. Allahabad stands at the confluence of two of India's holiest rivers,the Ganga and the Yamuna. The town is the Indo-gangetic plain and at the confluence of two sacred rivers,the Ganga and the Yamuna.Many people believe that the third,legendary Saraswathi,joins them after completing the subterranean course from the Hiimalayas.It was this auspicious spot too,that the Gods rested the pot or kumbh,containing the nectar of immortality,the Amrit,after it had been churned out of the Ocean of Milk.This ancient tale could be a mythic way of expressing a geological historic event. This event is commemorated every three years and is held at each thirtha in turn; the Sangam is known as Tirtharaja,the king of tirthas and its mela once every twelve is the graetest and holiest of all.The Maha Kumbha Mela is the largest religious fair in India attended by literally millions of rejoicing the vast floodplains and and river banks adjacent to the confluence are overrun by pilgrims,tents organized in almost millitary fashionby the government,the local authorities and police. Near the Sangam this temple is unique in North India for its supine image of Hanuman. Here the big idol of Lord Hanuman is seen in recining posture. When the Ganga is in spate this temple gets submerged. Within this underground temple,inside the fort lies the Akshaya Vat or the immortal tree.Believed to have been visited by Lord Rama,the temple was also seen by the famous Chinese traveller Hiuen Tsang during his visit to this temple. 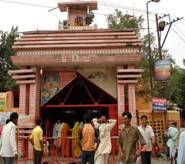 Situated near Saraswathi ghat,on the banks of Yamuna,this is one of the famous Shiva temple of Allahabad. This magnificent cathedral was designed by Sir William Emerson in 1870 and consecrated in 1887,is the finest of Anglican Cathedral in Asia is faced in White Stone with red stone dressing. This gigantic pillar of polished sandstone stands 10.6 metres high,dating back to 232 B.C. The pillar has several edicts and a Persian inscription of Emperor Jahangir inscripted on it,commemorating his accession to the throne. One of the most famous universities of India,it has a sprawling campus,graced by the fine buildings in Victorian and and Islamic architectural styles. Around 7kms from Civil lanes,overlooked by the eastern ramparts of the fort,while flood plains and muddy banks protrude towards the sacred sangam.At the point at which the brown Ganges meet the greenish Yamuna priests perch on small platform to perform puja and assist the devout in their ritual abulations in the shallow water. 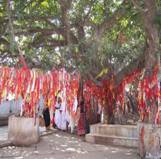 The immortal tree within the Patalpuri temple stands in a deep niche above an underground shaft which is said to lead to Triveni. This has found mention in the description of several ancient scriptures,writers and historians. This is 130 feet high with four floors and has the idols of Kumaril Bhatt,Jagatguru Shankaracharya,Kamakshi Devi and Yogsahastra Sahastrayoga Linga. 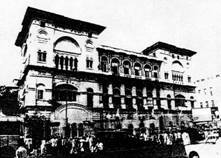 The old Anand Bhawan,which in the year 1930 was donated to the nation by Motilal Nehru,to be used as the headquarters of the Congress committee. Motilal Nehru renamed it as Swaraj Bhawa and it was here Indhira Gandhi was born. The erstwhile ancestoral home of the Nehru family.Today it has been turned into a museum which has many monumentous decisions,events related to the freedom struggle.The main building houses a museum which displays the memorabilia of the Nehru family. Adjacent to the museum this splendid park was once known as company bagh.It has some fine colonial buildings,including a public library. the foundation of which was laid by Lord Minto in 1910. A large garden in which tombs of Khusro,son of emperor Jahangir and Shah Begam are located. For a celestial trip to the scientific world,visit this planetarium.It remains closed on Mondays. This museum has a good collection of sculpture especially of the Gupta Era. Situated near the Thornhill and Myne Memorial,this large hall has a 180 feet high tower.Professor gamble of the South Kensington museum,London,ornamented the interior of this memorial hall. Completed in 1879 this hall was meant for public meetings,halls and receptions in commemoration of the assassinated Viceroy. Though there is nothing much to shop in Allahabad,it has number of shops offering items used for rituals such as sandalwood, incense, incense stick, vermilion and camphor among others. The city is also famous for its bookshops.However there are number of malls and shopping complexes coming up now in the city.The main shopping area is located in Civil Lines, Chowk and Katra. 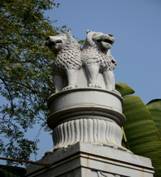 There are no foreign embassies located in Allahabad, but the nearest one is in New Delhi. There is no air link to Allahabad.Nearest airport is at Varnasi (147kms) and Lucknow (210 kms). Allahabad is well connected by trains with all major cities like Kolkata,Delhi,Jaipur,Lucknow and Mumbai. Allahabad on national highways 2 and 27,is connected to other parts of the country with good roads.